A pleasant walk exploring the secretive Bordley valley and visiting Winterburn Reservoir and the modest summit of Weets Top. 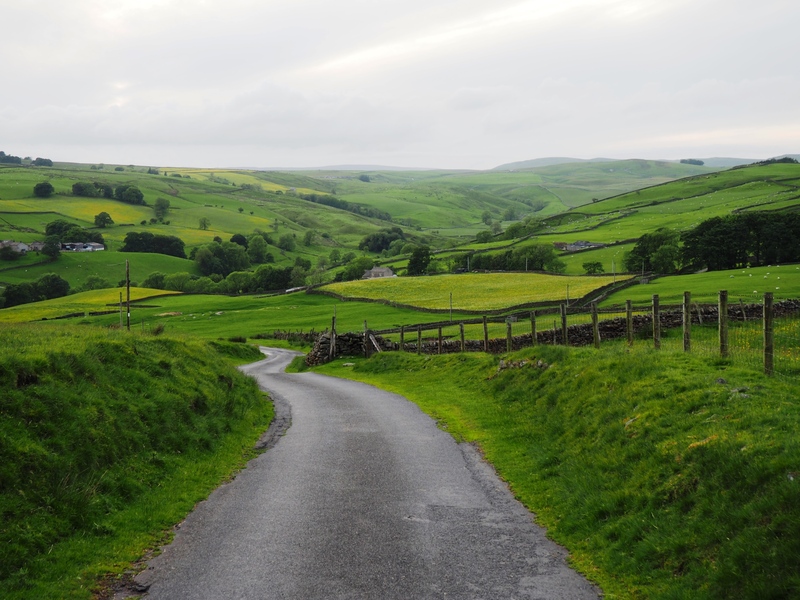 Between Malhamdale to the west and Wharfedale to the east is a hidden valley. Stretching from the remote hamlet of Bordley in the north all the way to the village of Winterburn in the south the valley does not seem to have a definitive name. Indeed the stream that runs the length of the valley changes name from Bordley Beck to Hetton Common Beck to Winterburn Beck. Despite a network of public rights of way, particularly in the upper reaches of the valley, it is not an area that seems to be particularly well known to walkers. Whilst I’ve walked in the area I’d not explored any of the paths between Winterburn Reservoir and Bordley. This then was the main purpose of this particular walk, with the added bonus of visiting the summit of Weets Top, a hill I’ve previously climbed twice from the Malhamdale side. The walk started from high up on Boss Moor where I parked the car on the side of the road just beyond a cattle grid on Boss Moor Lane, a long dead end road leading to Lainger House from Fleets. From the car I was able to immediately drop down to a nearby gate and on to the bridleway, marked as Moor Lane on the Ordnance Survey map. Initially an enclosed sunken way the track descended to a major junction of paths at which point I turned right on another bridleway heading for the top of Winterburn Reservoir. After crossing a bridge over Hetton Common Beck I turned left for a 100m detour to take some photos of Winterburn Reservoir. Along the way I managed to get a few pictures of a dunlin that was flying about as well as one of the skylarks that I’d heard singing as I descended Moor Lane. Returning back towards the bridge I then took a bridleway, which here follows the route of the Dales High Way, to climb on to Hetton Common. This climbed steadily up on to the moor with good retrospective views of the valley below and south towards Flasby Fell. It is worth noting that I made a couple of detours to avoid cattle grazing just after the start of this bridleway and then again near where the path crosses Raygill. Having taken measures to avoid the cows, the path then circled around the grassy bump of Hetton Common Head to reach a gate. Passing through this it was then just a few minutes walk to the trig point on Weets Top, at 414m the highest point of the walk. It had been a beautiful day but, as has happened a few times this year when attempting an evening walk, high cloud had moved in not long after I’d got going. While this was a shame for photos I still enjoyed an extensive view over the Malham scene with Ingleborough making a cameo appearance to the left of Fountains Fell. After having a bite to eat I left the trig point to descend an enclosed path heading for Hawthorns Lane. At the top of the path is the remains of an old cross, similar to the well known Nappa Cross on the hillside on the other side of Malham. Strangely this particular cross is not marked on the map. At a bend in the lane I took a stile on the right to cross a pasture to re-enter access land and a strange area of scattered and wind warped trees. Passing through the trees I dropped down a field to the farm at Park House. From there I took a track passing the building at Bleak Bank to descend a beautiful meadow full of buttercups and a sprinkling of red clover and yellow rattle. Beyond the barn called Low Laithe a track formed that then led me down towards Bordley Hall. The track passed around the northern end of the extensive cattle sheds next to Bordley Hall to join the farm’s access road. Crossing over Bordley Beck this climbed steeply up the other side of the valley before eventually levelling out. Turning right on this it was then an easy and enjoyable 1.75 mile walk back to the car. There were some fine views of the valley and, not for the first time in the evening, I cursed the high cloud. By this point it should have been ‘golden hour’ and had the sun been out I would have been able to get some lovely pictures. Eventually, after passing the grand looking Lainger House, there was a short pull back up on to Boss Moor Lane and, after passing some quarry workings, I arrived back at the car. This is definitely an area that is worth exploring. There was a bit too much in the way of cattle for my liking so maybe one for me to go back to in the winter. Having said that the summer meadows above Bordley Hall were beautiful.